Don't forget the awkward, forced conversation about nothing while one of the characters has a phaser under the table. At this point, I'd consider anything new in the Star Trek franchise to be a positive good, especially if it's something that expands the mythos past the scope of the universe as it's been presented. I think the best value Trek has to offer at this point is as a landscape for people to play in with their own divergent perspectives and goals. Tarantino is a good start. 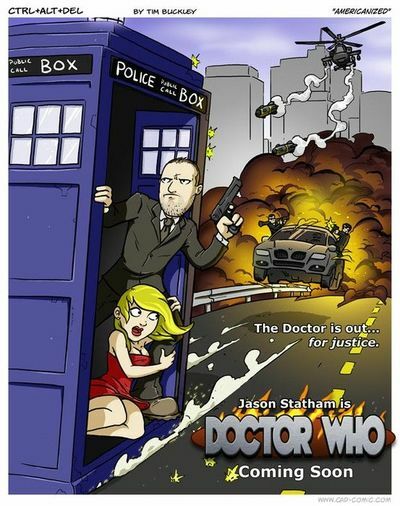 Jason Statham as Doctor Who. I'd watch it. Edited by Copper Bezel, 08 December 2017 - 09:45 PM. This has a lot of Likes for a Tim Buckley comic. Tarantino is known for wonderful characters and great dialogue, providing everyone in his massive ensemble casts a place to shine. He'd be awful for Star Trek. Truly awful. Like that one film directed by Spock. Everyone hated that film. At this point it couldn't be worse than what's currently on the table, so.... I'm at least curious. Also, Michael Bay Who would be the 1960's movies but with more explosions, minus the genuinely good scripts cribed from successful episodes. I'll joke about this all day but I want it immensely. I'm picturing an intense trade deal gone wrong on deep space 9 and everyone dies. What's Guillermo del Toro up to after he's done doing weird and compelling things with Kojima? Let's get him in on it. Let's make Trek an anthology series with new directors coming in to put their own spin on it! Keep that blood fresh and creative! So a Star Trek movie where the crew has to deal with an elder god while slowly be driven insane? Right, right, there have been episodes like that! Day of the Dove comes to mind. That was a fantastic episode! Edited by The Doctor Who, 08 December 2017 - 11:23 PM. Might get me to watch something Star Trek for once in my life. What's Guillermo del Toro up to after he's done doing weird and compelling things with Kojima? No one is ever truly done doing weird and compelling things with Kojima. Edited by Fishbug, 09 December 2017 - 12:05 AM. That's fine, let's bring Kojima on along with him. He seems to be keen on making a movie!